1) It’s not as much about a bulging chest, as it is about a concave belly. The guy who wore this coat was really, really skinny. He was also well-built — broad shoulders, with sinewy musculature on his arms. His hips were very narrow, and his torso was long. That curve you see on the front of the garment? That’s the exact shape that a thin man makes when sucking in his stomach. His ribcage expands as the belly pulls in. I never would have made this connection without seeing it in person. The intense curve on the chest is less about padding out the chest and more about pulling in the stomach. So obvious, and yet somehow photos obscured this observation until now. I am contradicting my own statements in a paper presented at Kalamazoo, Martial Beauty: Padding and Quilting One’s Way to a Masculine Ideal in 14th Century France. This isn’t the first time I’ve reversed my thoughts on something, however. Lest you think it’s preposterous to assume men went around sucking their bellies in that much, keep in mind these were, for the most part, thin, highly fit men. Bellies did not have to go that far, because they were already pretty flat. There was clearly a fashion for this silhouette, and if it required a little gut-sucking to get it, guts got sucked in. Remember, we’re living in the age of pants balancing just below the curve of the backside. Do not assume something is too impractical for fashion. Apparently nothing is. 2) My article describing the cutting layout is correct. 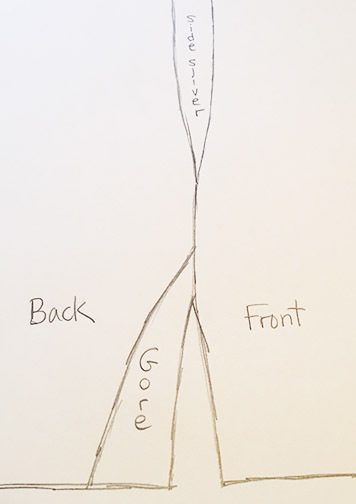 My methodology for determining the layout of the original garment on fabric remains sound after viewing the garment in person. (Though best yet would be to have my white-begloved hands on it.) I confirmed that the tiny piecing added to a back gore only occurs on one side, not the other. You will have to forgive the murky picture. The lighting was terrible and the glass was highly reflective. Extra piecing only occurs on the left, as you can see in this photo. This strengthens my guess that the affected back gore was originally whole, but either a cutting mistake or a stain or some other problem occurred at one tip, and that portion of the fabric was replaced. The exhibit where I viewed it allows you to walk around the garment, 360 degrees, so you can really examine the back. 3) Adrien Harmand’s pattern diagram is, for the most part, correct. Not that I had much doubt about it to begin with, but in case anyone else did, I think it is an excellent diagram of the original’s pattern. 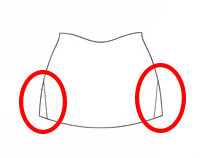 The first of two small gripes I have is that the layout of the tiny gores inserted at the bottom of the skirt could be better explained by showing them set slightly apart from the skirt. The illustration shows them attached to the skirt, which is confusing, because no other pieces are portrayed that way. Bottom back piece with small side gores attached. They should hover a small distance away for consistency’s sake. Incidentally, if you’re curious how those small side gores are applied, they are inserted on the bottom back piece, and extend slightly above the side slits. The second gripe is that the tiny piecing shown on the tip of one of the back gores implies that it exists on both sides. It doesn’t, as discussed above. Piecing at the edge of a back gore exists on one side only. 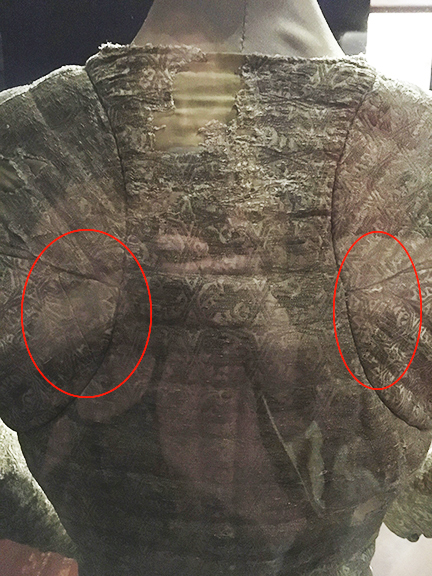 4) The garment doesn’t seem to be padded and quilted, though strong evidence of previously-existing quilting lines can be seen. 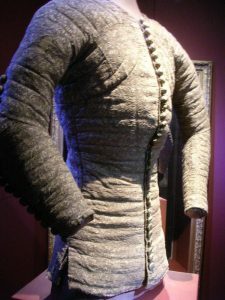 Perhaps there’s a French academic publication that describes every layer of this garment and whether or not it was originally padded and quilted, but my confusion remains on this subject. Seeing it on its form, it appears like maybe it is lightly padded all over, but there’s no evidence of current quilting stitches. The garment does have indentations where quilting stitches appeared to one time be. I also don’t see any evidence that the chest is padded out. As stated above, it looks more like the shape of a thin man’s ribcage set over a concave belly than it looks like bulbous padding over the chest. The question is begged: if the chest isn’t padded out and the garment isn’t quilted, why call it a pourpoint? Maybe this article will inspire someone in-the-know to explain it to me or provide some trustworthy documentation. 5) Boxy Buttonholes for the Win! This coat has the strictly rectangular buttonhole design which I provide step-by-step instructions for recreating. These buttonholes look exactly like those seen on the red coat armour in Chartres, France. My rough sketch of a boxy buttonhole. Note there are no stitches that arch around the sides. Given that the two coats were made approximately 16 years apart and very likely by different people, it’s safe to say that the boxy buttonhole style is broadly fashionable in this time period in France, especially for masculine buttoned garments. 6) The flat buttons are made from thick discs which are not stitched through. Unlike the red coat armour in Chartres, the flat buttons on this coat are thick discs reminiscent of a large, chewable Vitamin C tablet. There is no additional stitching throughout the disc’s surface, like that seen on the red coat armour. The exhibit included a small pile of silver-colored metal shank buttons, both of spherical and disc-shaped variety. The plaque doesn’t make it clear whether the metal buttons are reproductions of what’s under the fabric surface or not. The flat buttons on the Charles de Blois poupoint are not stitched through. From the side, it is clear there’s a very thick disk creating structure under the fabric. I could not see the shank composition. The flat buttons on the Charles VI pourpoint are stitched through. The discs inside are rather thin, and the shanks are made from silk floss. 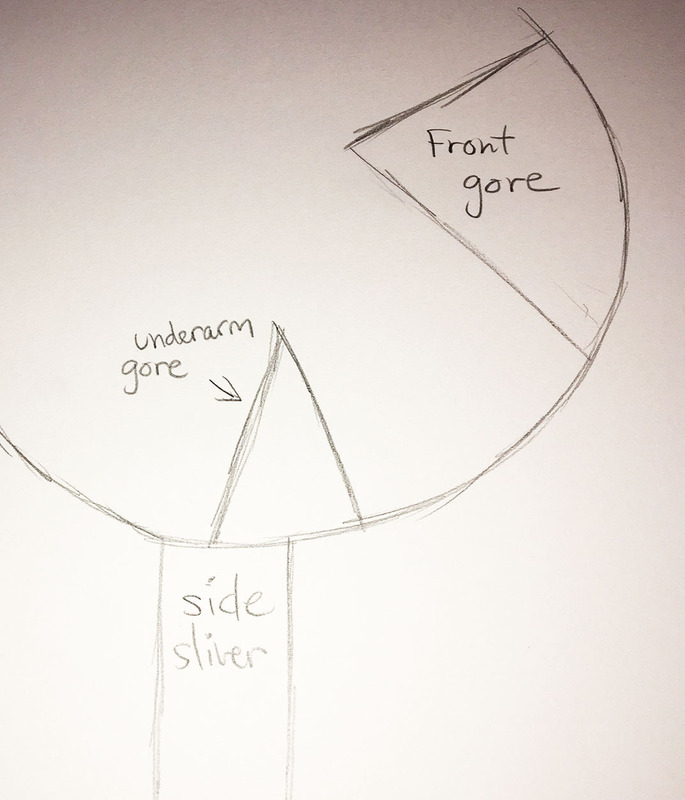 7) Placement of the underarm gore—slightly forward of the side seam. It’s really hard to see in a photo exactly where the underarm gore sits in the giant armhole. In person, I was able to see it. 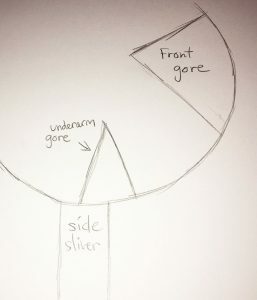 If you add the side-sliver to the front piece, the underarm gore sits slightly forward of the side seam. It straddles the seam of the front piece joining the sliver. 8) It’s on a specially-shaped form… Of course it looks perfectly tailored. I think a lot of people forget that when they’re viewing a garment in a museum, it is usually on a 3-D form which has been specially made to fill in the internal space. 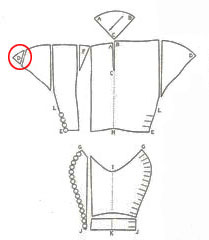 In the case of this pourpoint, it’s filled so that the excess fabric created by the pattern in the upper back where the arms meet the body is completely removed. This gives the form an exceptionally masculine and muscular look. In addition, the arms are posed at a 45 degree angle, lifted away from the body and bent at the elbow. This further ensures that the excess fabric will be minimized not just at the shoulder blades, but also at the elbows. I’ve heard people fret over this with their own re-creations. They see a picture of themselves wearing the garment with their arms at rest at their sides and complain of seeing ungainly pockets of fabric. Duc Charles de Blois no doubt had the same experience when wearing this garment. Nonetheless, the original designer made it the way it is to maximize mobility of the upper back and the entire length of the arms, and that requires a lot of space where joints move around. I hope this update has been as educational for you as it has been for me. If I were to admit to having a bucket list, I can say that I have checked off a big item, with caveats. Only a full, hands-on examination would truly satisfy me and my long list of questions, natch. But for now, I’m really happy for getting the opportunity I thought I’d lost.